It’s probably obvious from the article posted earlier today about sideloading apps onto the Kindle Fire, but just to make it explicit, Mashable reports that it is fully possible to install the Nook Android app onto the Kindle Fire. 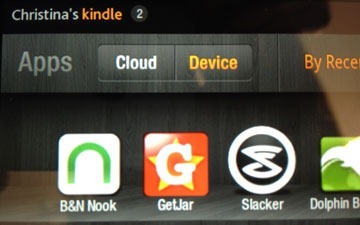 There’s not really anything new in this; one favorite activity of Nook Color jailbreakers has been to install the Kindle Android app onto their tablets. On the other hand, the Kindle Fire does have going for it the fact that you don’t have to jailbreak to do it. Of course, those who own third-party Android devices (or for that matter iOS devices) can put both Kindle and Nook apps on their devices without having to do anything out of the ordinary. Regardless, this added e-book store flexibility may give the Kindle Fire that much more appeal to potential shoppers. It certainly would be a selling point for me.